As I'm sure many of you know, this past week was Read Across America week! 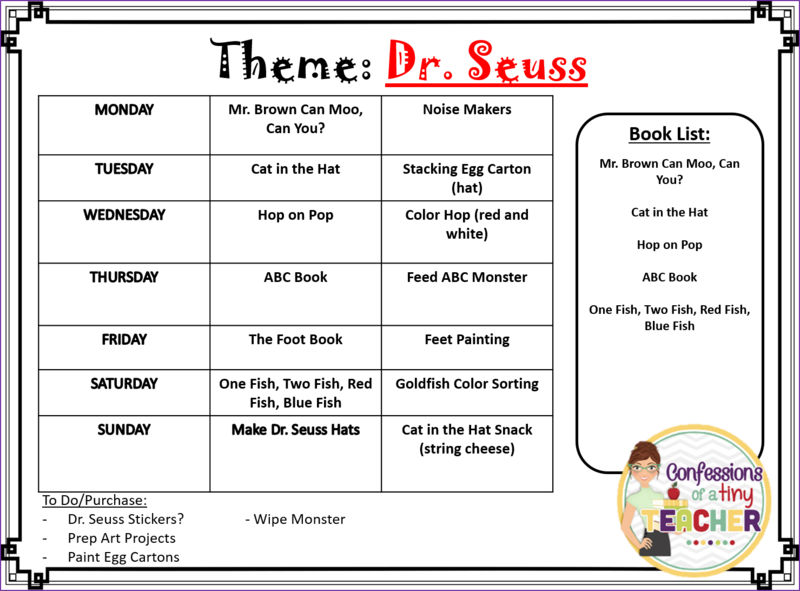 And despite my best planning efforts and my love of all things Dr. Seuss it just didn't happen for us. I don't even have a good excuse! 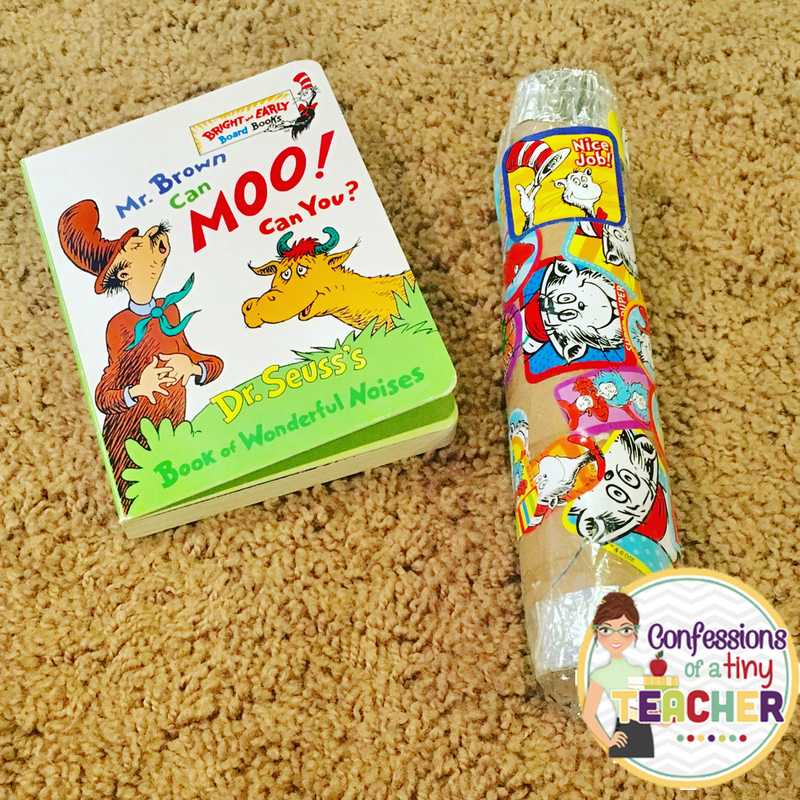 We read Mr. Brown Can Moo! Can You? This is one of Cohen's favorite books. He likes it so much that this was our "mysteriously disappearing" book of the week! After reading the book we made our own little noise shakers. - Something to decorate with! 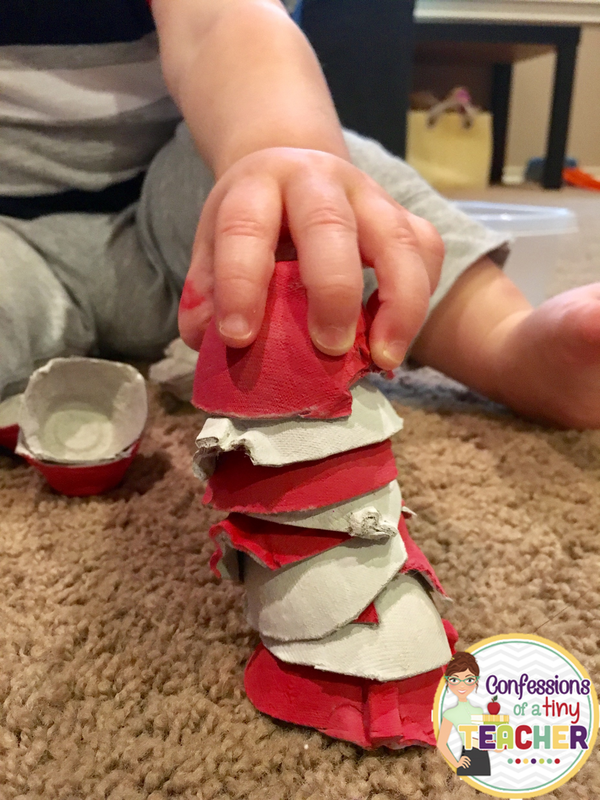 After I got one end taped up, we used beans and coins to fill up our shaker. Cohen then colored with marker and decorated with Dr. Seuss stickers that we found in the Target Dollar Spot! This was probably the most successful activity of the week! Which is a little depressing but, you know, it is what it is. After reading Cat in the Hat I used egg carton cups (that we painted together) as stacking practice to make the cat's hat. Cohen really liked this activity and it kept him busy for quite awhile. 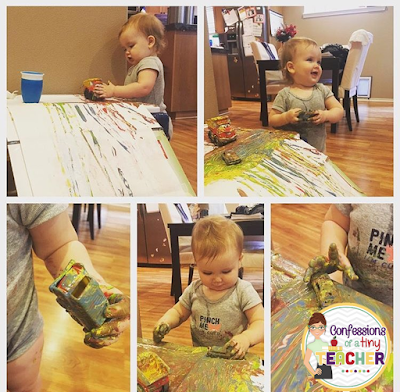 We did not do this activity, mostly because when I set it up, Cohen took that as an invitation to go full on destructo-baby and throw the color spots all over the room. 😒 We did however read Hop on Pop and that was a big hit! So I bought these cute little foam alphabet pieces awhile back at the Target Dollar Spot (yes, I have a problem) and couldn't wait to use them! They were kind of whimsical and Dr. Seuss-esque so I thought they would be perfect for this weeks activities. We read the ABC Book and then we fed the letters to our wipe container monster! Have you seen those cute little wipe container monsters on Pinterest? Well ours did not turn out like that. 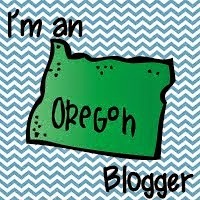 I'm not even going to post a picture, it is that embarrassing and I'd really rather not end up on pinterestfail. Given our track record this week, we decided to skip the messy art project. After reading One Fish, Two Fish, Red Fish, Blue Fish we attempted to color sort our rainbow goldfish. Well let me tell you...Cohen did not try to eat a single goldfish. He sorted them all perfectly on his own. And then afterwards he cleaned the entire living room and cooked a 4 course meal. Or he shoved all the goldfish into his mouth at the same time and then proceeded to scream for more while his mouth was still full. You know, one of those two. 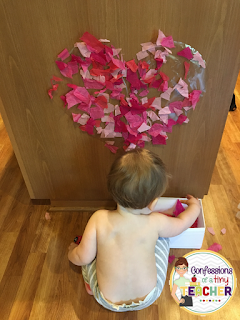 Confessions from Toddler School: My Body! If only we were doing our teeth theme! This week is all about the body and learning where our body parts are! 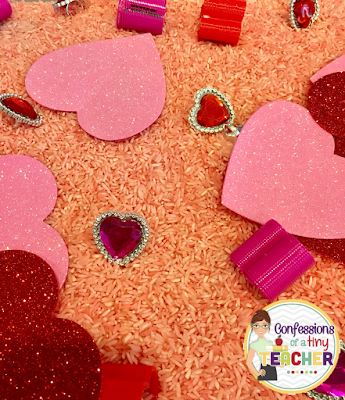 This was a super simple sensory table and all about discovering our body parts! You can find these body part cards in my body pack. I glued them onto a yellow background (Cohen's favorite color) and then laminated them! I then scoured the house for any little mirrors I could find. I also picked up some compact mirrors at dollar tree that worked perfectly! We would pull out cards and talk about the body part and then use the mirrors to find them on our bodies! You can also find these dice in my body pack. I made a set for parts of the face and a separate one for parts of the body. We used the dice along with the Hokey Pokey (or in our case Hokey Mokey - Cohen's nickname). I was a little nervous about how this activity would go! Cohen is not one to lay down or sit still but he actually did really well. 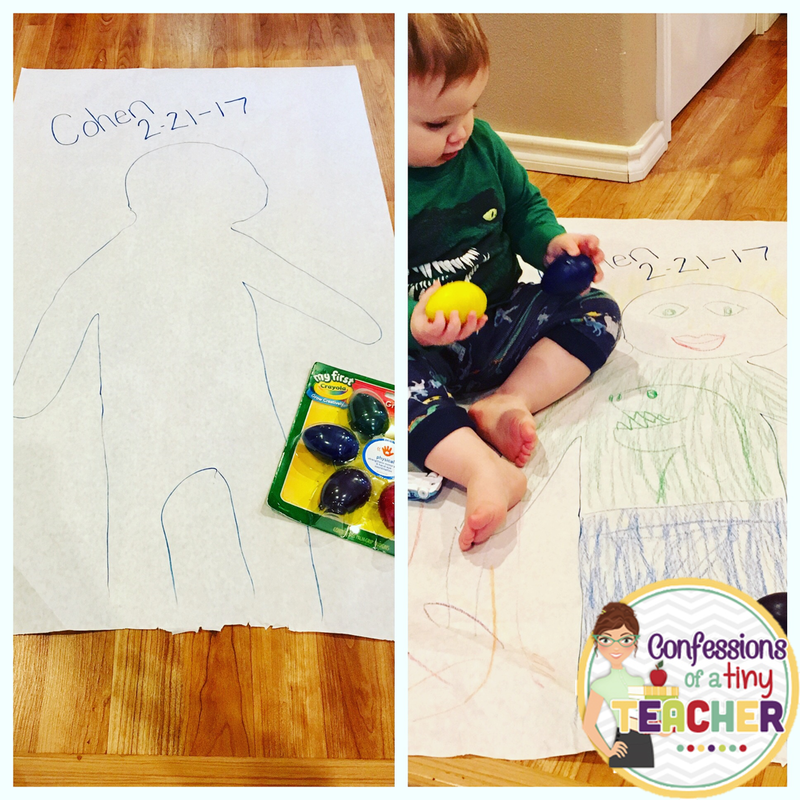 I sang Head, Shoulders, Knees and Toes while I traced each part and I think that may have helped! We had a lot of fun coloring together! If you have little ones I highly recommend these egg shaped crayons! 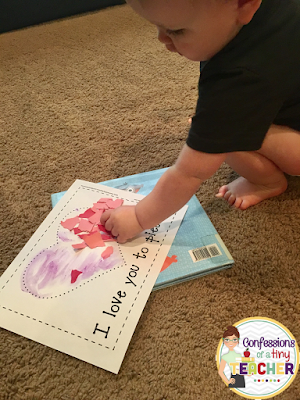 They are perfectly shaped for toddler hands and gives them so much control! His face says it all! We sang this little song I made up and put stickers on the body parts as we went. And kissed them of course! it’s oh so nice smooch! This song was a hit! He now comes over to me and starts the movements so I will sing for him! It's working! 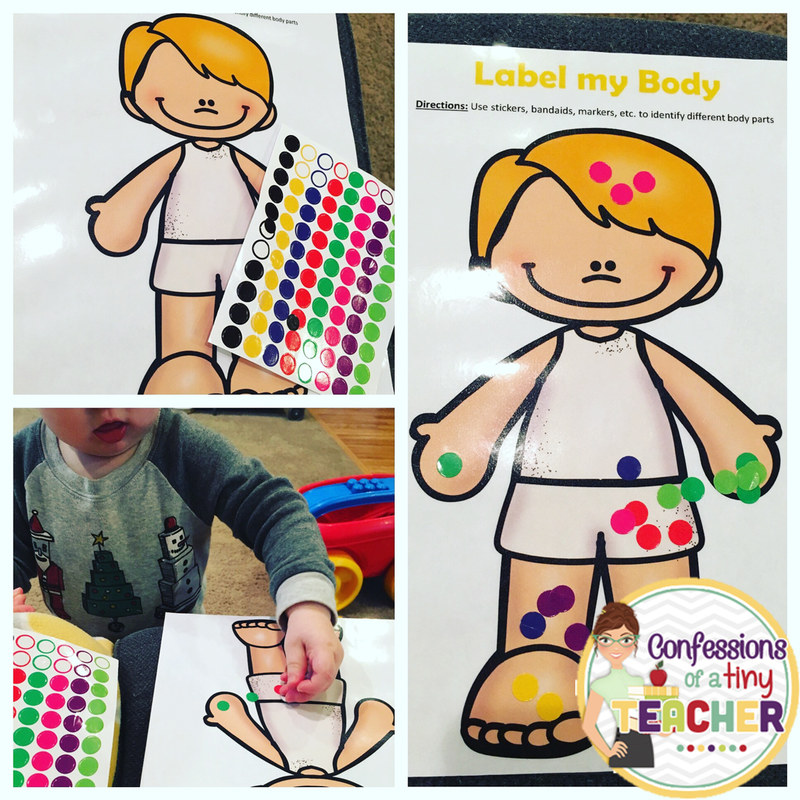 We also used the stickers to label body parts on this little boy outline! You can also use band aids or a washable marker (if laminated). 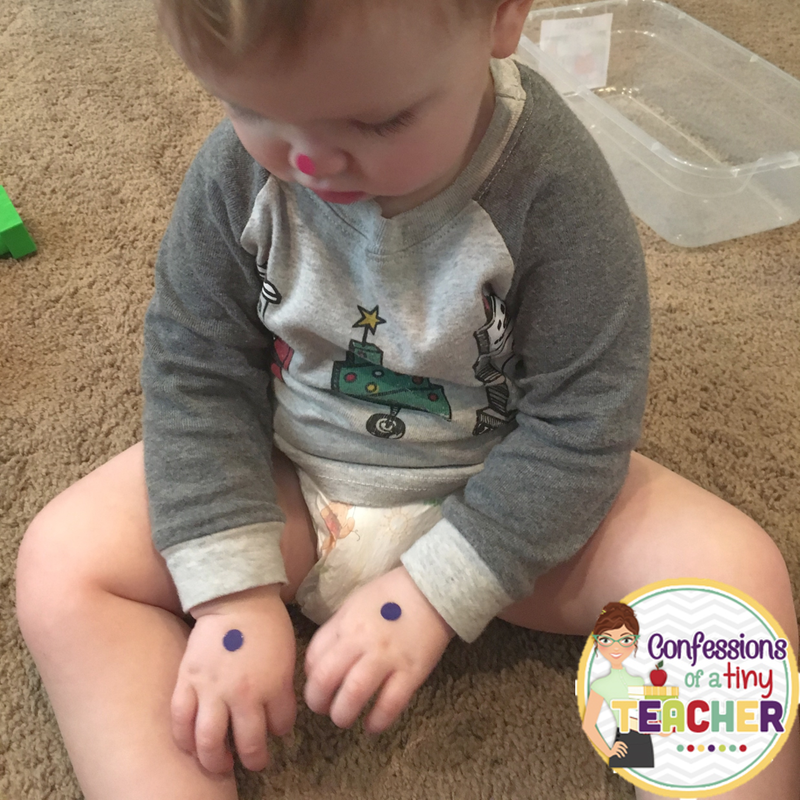 He was so focused on developing a technique to get the stickers off his finger and onto the paper. 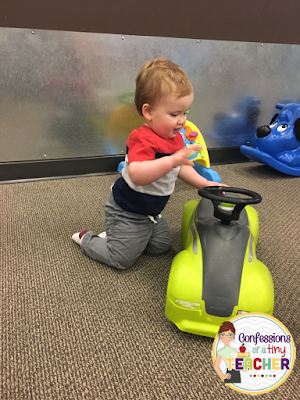 Perfect for developing his fine motor skills! And he loves it! He brings it to me several times a day. I put the first sticker on each body part as we talked about what they were. I chose a different color for each body part and then while Cohen was putting his stickers on he color sorted them himself! I don't think I've ever been so proud! This outline can be found in my body pack as well! This is another on of those books that we had to read so many times that it mysteriously disappeared. We would find the baby's hidden body parts under the flaps and then use the mirror to find Cohen's. Does our emergency trip to the dentist count? Wow! This week has been the longest and shortest week of my life! In some ways it just flew by and in other ways I swear it's still Monday. 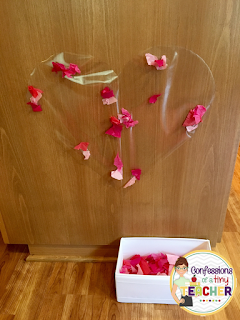 On Sunday I hosted a really cute little Toddler Valentine's Party for my mom group that I started on Facebook! 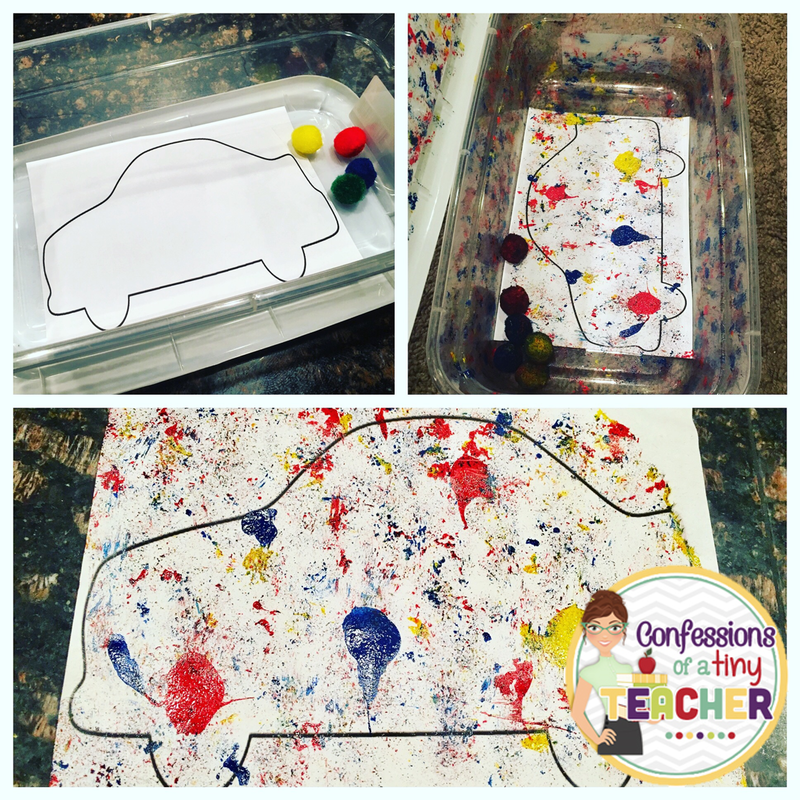 I put out a bunch of these activities and the kids had a blast! Having all the activities prepped ahead of time really helped the week flow more smoothly! These Foam Hearts have been amazing! We've used them for so many different activities! Our favorite right now is color sorting. I chose 3 colors red, purple and pink. I set one of each out and then we practice color sorting (check out my IG for a video of this in action). I say "This heart is red. Does the red go here (putting it by purple)?" Then I model shaking my head and saying no. I do the same thing by pink. When we get to red I say yes, have Cohen repeat "yes" and then we clap! When we first started he had no clue and would only last about 2 seconds. But he brings me the hearts several times a day and now we can get all the way through the stack. He shakes his head "no" on his own and says "yes" when we get to the right color! This sensory table was a huge hit at our Toddler Valentine's Party! All of these things were found at Dollar Tree! TGFDT (Thank God for Dollar Tree)! I saw this idea on Pinterest and thought it was so cute! 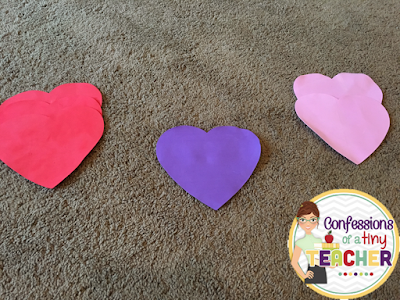 We used the same Foam Hearts as above and a long sheet of white butcher paper (my husband keeps it in stock for his business and we use it all the time). I put all the letters to spell Cohen and his friends names on the hearts and then traced the hearts onto the paper in the right color. This game has so many options! 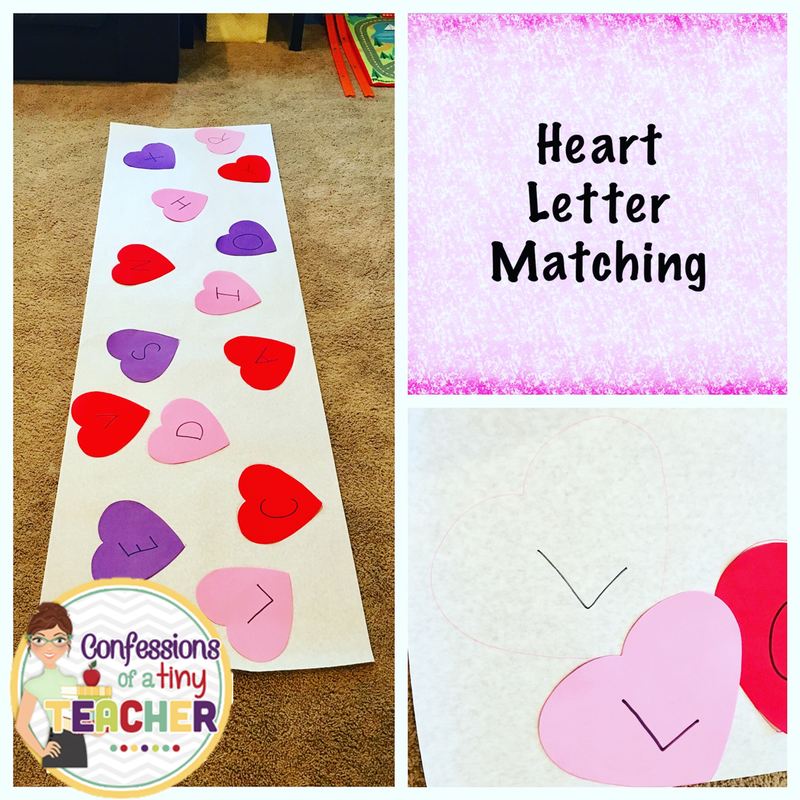 Matching colors, matching letters, even as a gross motor twister kind of game! The possibilities are endless! Admittedly this activity was way above Cohen's pay grade so we used it to continue our color matching! This was our super easy and relatively mess free art project for the week! 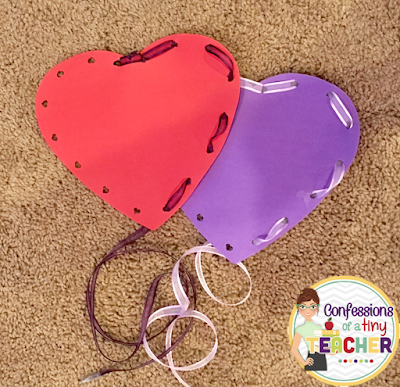 I provided some Valentine's colored scrap paper for Cohen to tear (fine motor) and glue onto this cute little heart template I found from Learning with Letty. You can find this free template here. Cohen thought it was more fun to watch me tear the paper (have you seen that video of the baby giggling hysterically while the dad rips paper, yeah, it was like that haha). But just look at how focused he is! I love how it turned out so much that I decided to keep it in his little art binder! We used our Foam Hearts again for this fine motor activity! 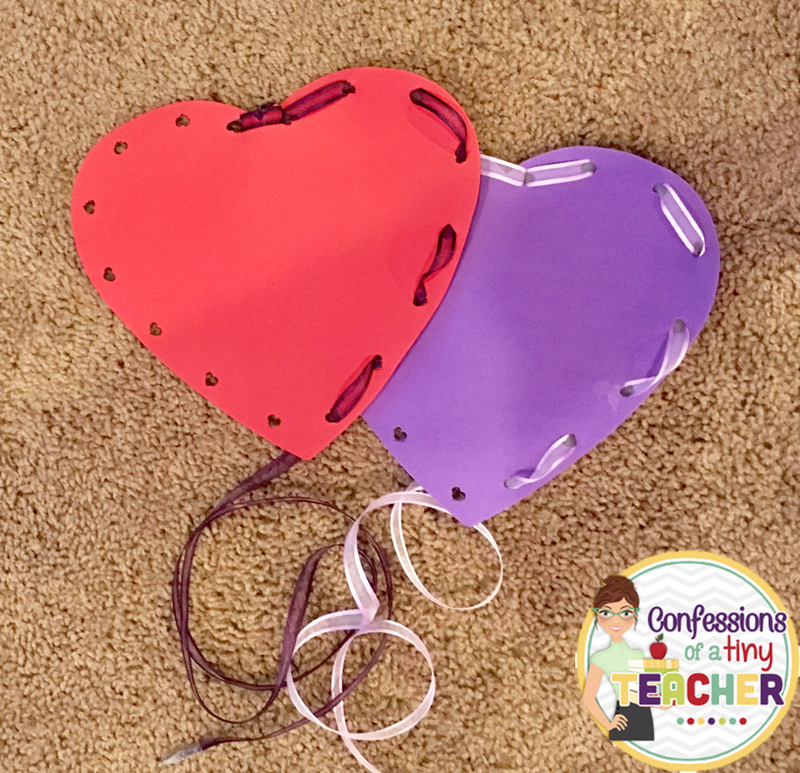 I took a hole punch and made these little lacing boards for Cohen! He loved practicing weaving the ribbons in and out. These are great too for on the go! We've been taking them in the car with us since our car seat is something that can be used to torture prisoners for information... or so he seems to think. 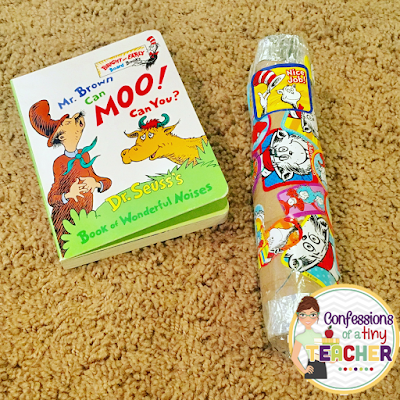 Cohen is obsessed with anything If You Give A Mouse or Llama Llama so he was super happy with our books this week! 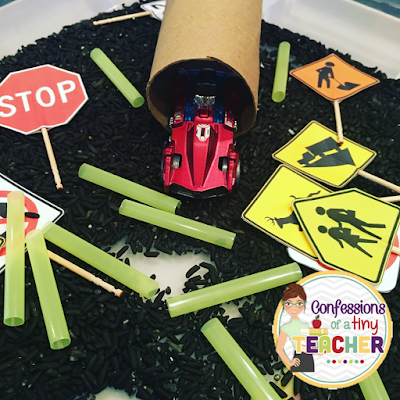 Confessions from Toddler School: Cars! You guys are not going to believe the last 2 weeks we have had. I'm not even sure I believe it myself! It started with a cold that got our entire family. 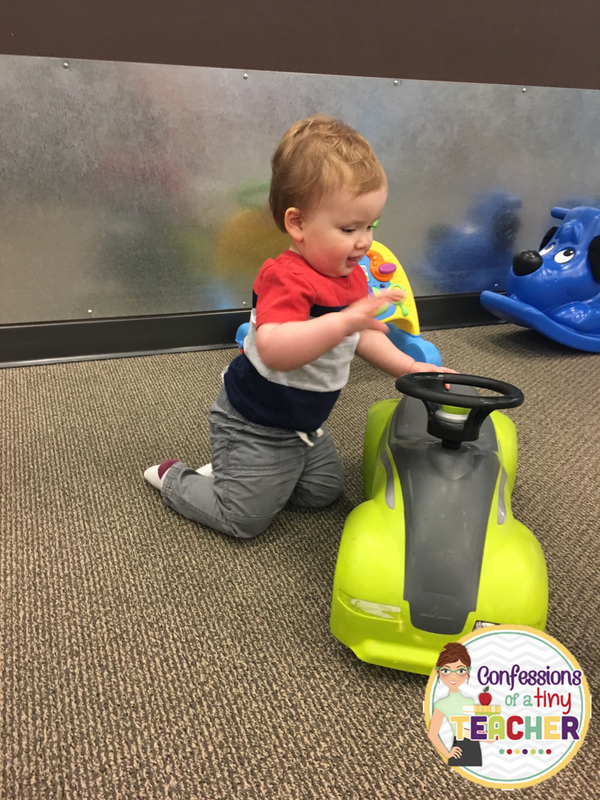 Just when we started to feel better, Cohen got his 18 month shots and was not feeling hot. And then the kicker, my husband ended up in the hospital for some crippling stomach pains. Long story short, while in the hospital I started to get the same pains and then about an hour after we got home, Cohen got them. We spent a solid 48 hours down for the count. Being sick and dealing with a sick toddler (and husband - not sure which was worse) was the hardest thing I have ever had to do. I had to summon strength I didn't know I had. Needless to say, we did not get to all of our activities in a single week. We stretched it out over 2 weeks and got to almost all of them! This activity was SO much fun! And super messy! To build the ramp I used some cardboard and taped it to the top of his sensory table. I put some towels at the bottom to protect the floor as best I could! On the top, I put blobs of colored paint and mirrored how to drive the car in the paint and then down the ramp. He picked it up (and behaved) so much better than I anticipated! I definitely want to do this one again. - I made these cute little road signs. (You can find the signs in my car pack on TpT). Then I just taped onto tooth picks! I found this awesome Road Tape on Amazon and it was perfect for our car unit! We actually had a play date this day and the littles loved walking on the roads! It was super cute to watch. We have been working on our numbers this week with our cars! 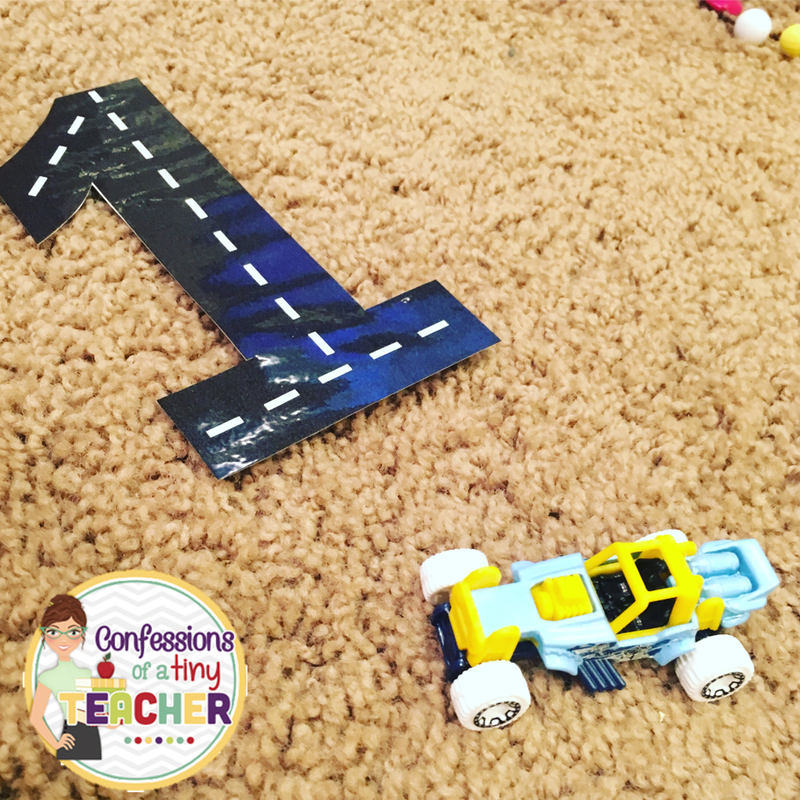 I made these number roads for Cohen to drive his cars on! 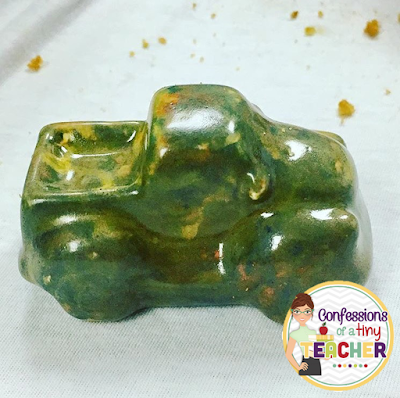 They are the perfect width for the little hot wheel cars! I posted the shape ones on our wall. Cohen loves to point to them while I say the shape name! 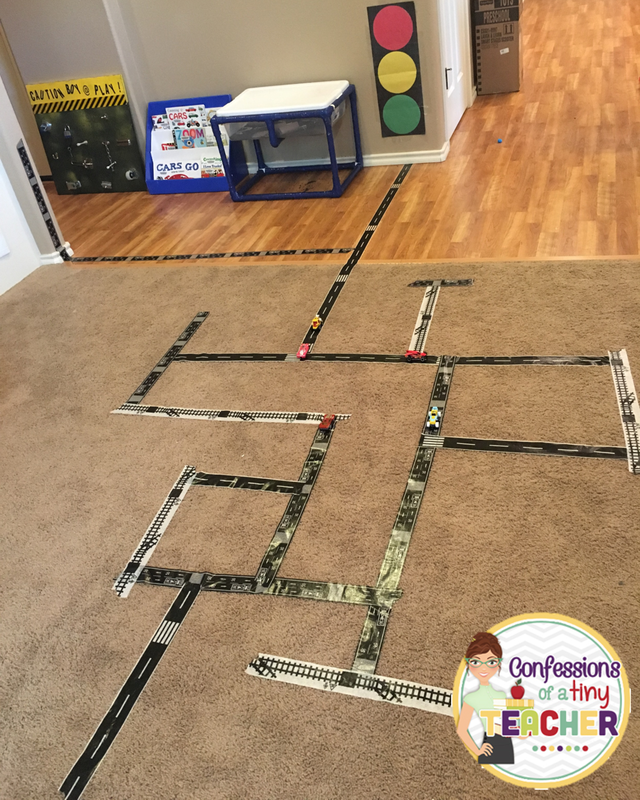 You can find the number and shape roads in my car pack! He's really starting to be able to identify numbers, shapes and colors! It's amazing watching him learn! This is one of the activities from my car pack! The original page just has the numbers (no dots). I added the dots using an expo marker so it can wipe off! I then put numbers/dots on 6 of his hot wheels. Cohen has a million cars, literally a million, so finding 6 wasn't difficult! Admittedly this activity is still a little over his head, but he had fun watching me drive the cars to the right parking spot. He's just starting to get matching so he should be able to do this on his own soon enough! We actually had to do this activity twice because the first time Cohen just ate his road 😝. 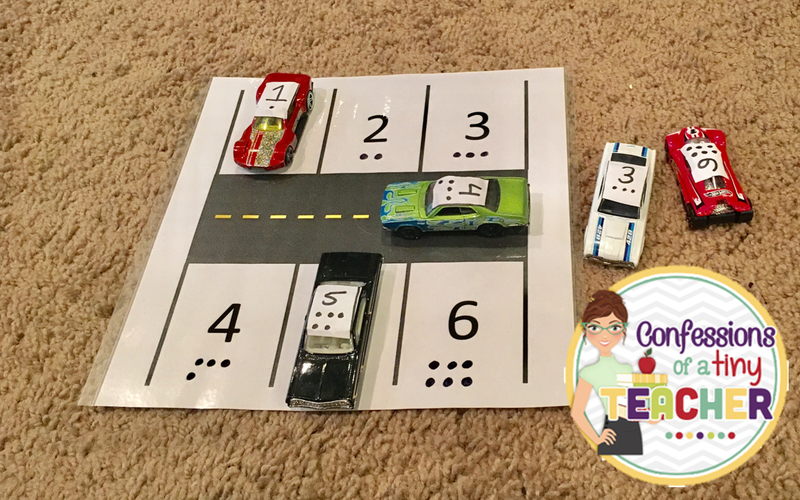 This was a fun little texture activity (and made up for the fact that we didn't get to play with our texture ramps). If I had to do it again I would find something to give us a bigger driving space though. 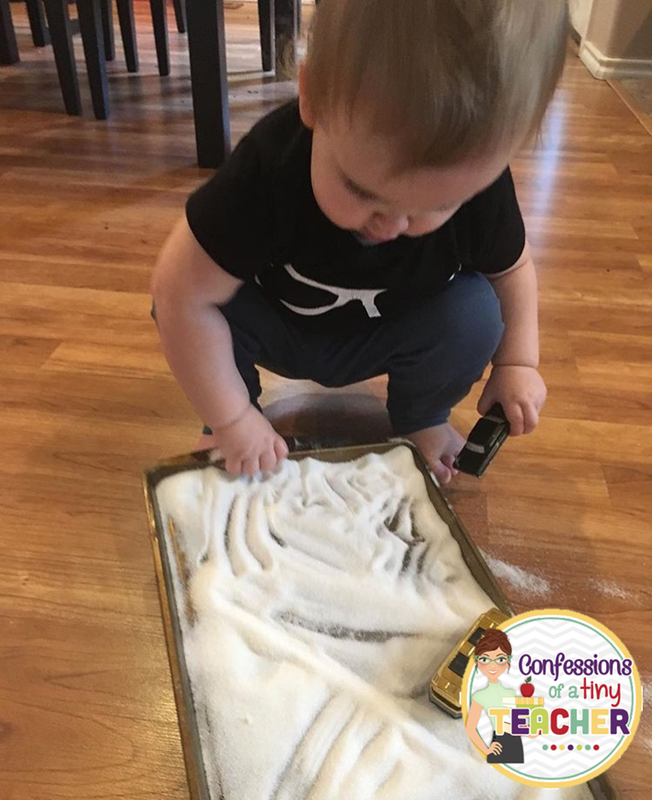 Perhaps the sensory table! I have a feeling this bad boy is never coming off of our wall! And I am okay with that! 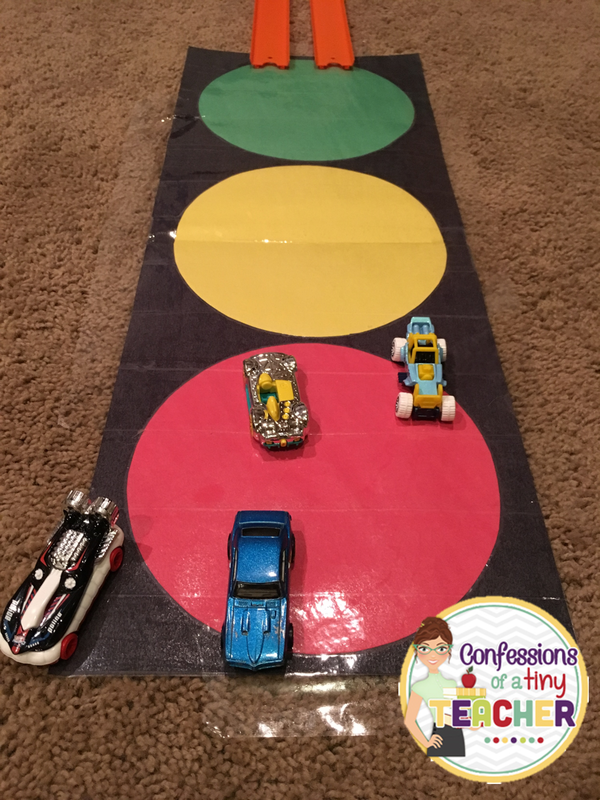 Just like the shape roads, Cohen has a blast pointing to the colors and having me say the name! 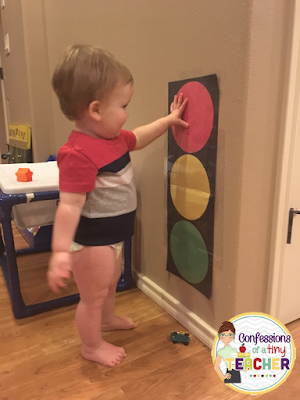 After having this up for a few weeks he can already identify red, yellow and green! I used the plate to trace the lights. Glued on and then laminated for durability! Originally I had planned to sponge paint these car templates but with all the sickness and fussy baby we've got going on, I decided to hold off and do something mess free! I taped the image down to the bottom of the plastic bin, dipped the poms in paint, dropped them in, put on the lid and let the little ones shake! So much fun! They turned out great too! One tip: When you drop in the paint covered poms, do it off to the side or you get big circle splotches on your image. Play Boutique - Before we got struck down by the plague we were able to get out for a play date at this awesome indoor gym for kids. We spent a lot of time driving cars around which was tied in nicely. Although Cohen's favorite was the bouncy house! I couldn't believe he just climbed in on his own! Firestone - We had to take our car in for a tire leak this week which worked out nicely for our car unit! I can not say enough nice things about the mechanics! 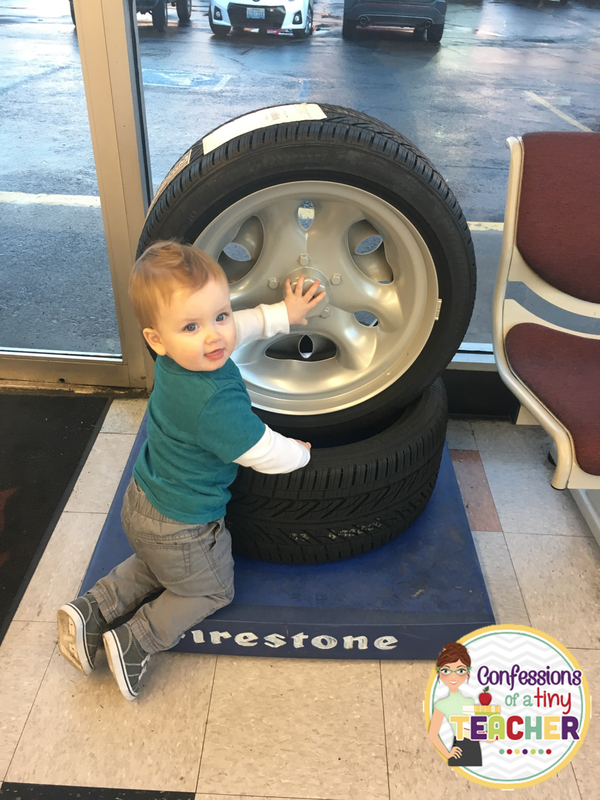 They let Cohen play with the tires on the wall and even played cars with him in the lobby. It was so sweet and Cohen had a blast! Because we have been battling so much illness we didn't get to a lot of the activities in my car pack. 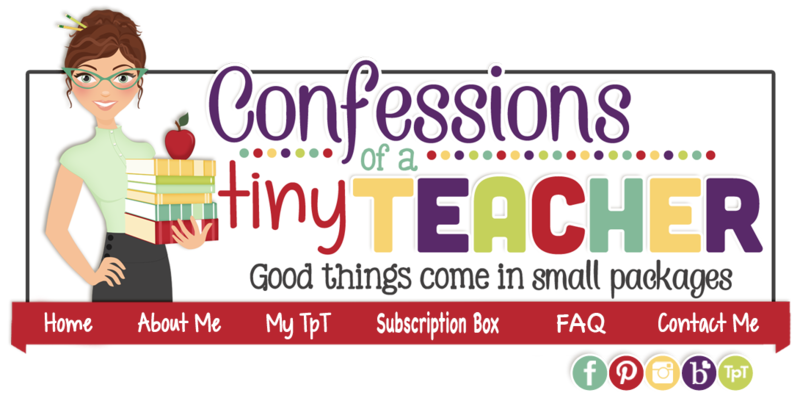 But you can find it in my TpT store. If you do try any of them out, I'd love to know how they go!